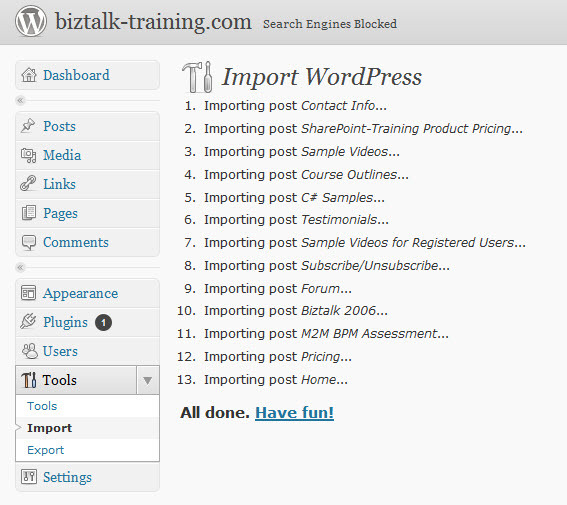 1) Used Fantastico from CPanel to install WordPress in a subdirectory called wordpress on http://BizTalk-Training.com. Then did upgrade to 3.0.4 since Fantastico installed 3.0.3. (10 minutes). This will allow us to practice, and build the new site while the old site is still working (you will of course need a hosting plan that allows two MySQL databases to this). The alternative is to build the new site somewhere else (another domain), then move it over later. 8) All posts/pages are now in an draft state. 8b) Go to Settings/Reading and select “Blog” as the Posts page. 8c) If you want a custom menu, go to “Appearance/Menus” and set it up there. http://biztalk-training.com/wordpress (you can copy/paste the link, I didn’t want the search engines to index it yet, so I didn’t put an anchor link here). I plan on putting the code and steps on CodePlex in the future. If you want it before then, please reply with your email in a comment below.